The numbers are staggering. According to Statistics Cnada, the residential construction sector comprise almost 30% of Ontario’s underground economy, which translates into approximately $4.5 billion in economic activity per year. That’s money that could have been spent on municipal and provincial infrastructure projects, from local transit and sewer systems to parks and hospitals—money that could help offset raising taxes. More than that, it’s money that might otherwise have been earmarked for legitimate contractors in Ontario—those who are keeping a paper trail of contracts and receipts, paying for insurance and building permits, keeping up on the latest training and everything else that goes along with operating responsibly and above board. Of course, if there’s no demand for cash deals, there is no underground economy. But you can’t entirely blame the consumer, notes Frank Cohn, host of the Home Improvement Radio Show on CFRB 1010 and proprietor of Cohn Construction. When consumers see governments mired in scandals many are not exactly guilt-ridden over keeping a few grand here and there out of the CRA’s coffers, Cohn regularly hears from his clients. Perhaps that’s why a 2010 Environics Survey commissioned by OHBA revealed that 56% of 1,113 Ontario homeowners surveyed paid cash for a home repair or renovation—and those were just the ones who admitted to it! In an attempt to divert a chunk of that work back to the ‘overground’ market—part of a larger mandate to curtail underground economic activity in all sectors of the province—MPP Laura Albanese, parliamentary assistant to Minister of Finance Charles Sousa, has been engaging members of OHBA and the residential construction industry to seek out their input. So why is the underground economy proliferating to such a degree? 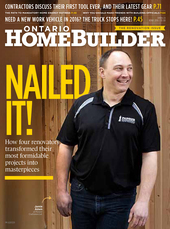 “Two things we all wish we had more of: time and money,” says Jon-Carlos Tsilfidis, president of Fairside Homes and Renovations Ltd. and BILD Renovator Council chair. On the financial side, contractors currently incur 9% in WSIB costs, 13% in HST, as well as income taxes, CPP and EI. That means that under-the-table jobs can be offered for up to one-third off the regulation price—a significant carrot for homeowners seeking to cut expenses. “We understand that there are task forces looking at changing WSIB rates, but when you’re asking a general contractor to pay close to the 10%, that’s a huge tax burden that ultimately gets passed on to the consumer,” Tsilfidis remarked to Albanese and company during the January 11 roundtable. “And there needs to be a serious discussion about HST on residential renovations. We exempt certain things like food, so there is precedence. Then there’s the time element, which refers to the regulatory burden. And this is where the province has been remiss. “It’s ridiculous that we have to wait 10-12 weeks just for a zoning certificate that will tell us what variances we need to meet,” says Sam Lapidus, president of Keystone Ridge Developments. “Then we still have a three- to four-month waiting period for committee, then the appeal period, and then the permit. So what should be a straightforward process becomes a sea of red tape. “Toronto is the worst (of the municipalities),” Lapidus says. “You’ve got a very slow building desk, a very large backlog with the committee of adjustments, and both an old and new zoning bylaw with contradictions between the two, which are written in legalese that makes it very hard for anyone to understand. While streamlining the process is undoubtedly required, there is no single way to incentivize homeowners more than to slash taxes on renovation projects, the experts agree. And while government traditionally looks at tax rebates as money flowing out of its till, the numbers suggest it might actually be a revenue generator. “When they added HST onto the labour component in 2010, I had almost 50% of my jobs cancelled, and the phone didn’t ring for almost six months,” says Cohn. “If you get a cheque for payment, you’re not going to pay your suppliers in cash; you’re going to want to be able to write off all your expenses associated with the job,” adds Tsilfidis. “One of the initiatives we need to remind the government about is the energy audit for resale homes—the legislation is already in place,” says Hamilton. “It would require every resale home that goes on the market to have an energy rating done and included in their listings, so that consumers understand the efficiency of each home, which motivates the seller, or at least informs the buyer about the kind of renovations needed to improve the energy efficiency of their home. Tying that to an energy rebate would again require a paperwork trail. While horror stories abound of consumers being victimized by the shoddy work of unscrupulous or unqualified contractors,the plight of workers themselves operating in suspect conditions is another area of concern. “When businesses fail to report their income for tax purposes or avoid meeting other regulatory obligations, consumers and worker safety is put at risk,” the 2016 Ontario Budget observes. “If (underground contractors) are willing to cut corners with the CRA, they’re willing to cut corners with WSIB and health and safety,” says Lapidus. The process of WSIB training and coverage, however, is not an easy one to negotiate for small businesses, says Keystone’s Lapidus, who is also part of an advisory group formed last summer to assist the Ministry of Labour in developing a Construction Health and Safety Action Plan. In addressing Albanese, OHBA representatives cited some sources of underground activity as illegal immigrant labourers who don’t want a record of employment, as well as economically challenged sectors of the province. The rising cost of owning a home in Ontario, which makes it difficult for new purchasers to afford to renovate via legitimate means, was also a point of concern, as was the state of the Canadian dollar, since many supplies are imported from the U.S. (or from overseas and traded in U.S. dollars), further driving up renovation costs. It also encourages the sourcing of substandard materials, which are either inappropriate for our environment or not CSA-approved. The need to address the problem at its root, however, was stressed to Albanese. “Put pressure on the homeowner and the illegal players—not the legit renovators following the rules, who are the low-hanging fruit, with business accounts and filing taxes every month,” says Coleman-Dias. The government took one notable step in that education process last summer when the Ministry of Labour, Ministry of Finance and the CRA undertook a pilot project targeting roofers and homeowners who hire for reroofing projects, the goal being to increase homeowners’ awareness of the risks of using unlicensed roofers. A month-long trial tested the performance of various ad messages on Google and Kijiji to direct homeowners searching for a roofer to a webpage filled with useful tips and the Consumer Beware List of contractors who had complaints issued against them. Traffic to the Ministry of Labour’s website increased by 144% during the trial. What’s more, although the pilot project only targeted roofing, it resulted in more than 1,700 orders for compliance, nearly 250 prosecutions initiated, and more than 550 information packages sent to homeowners and employers. As far as dispensing the information, OHBA is more than happy to facilitate the process, says Hamilton. “In 2002, the government put out a list of homeowner tips. We’d like to see more of that. We’ve been offering for years to work with governments and municipalities to develop a brochure with a government logo on it that our members could include when they go in to give their tenders. It would indicate to the consumer that if they’re going to shop around, that’s great, but understand that these are the risks and rules of the game. Suggestions to help stem the underground economy presented at the January roundtable included the mandatory requirement of a business license. “I think everyone needs to get an HST number,” says Adam. “Currently, small contractors billing $30,000 or less don’t need it. And every municipality is a little different. In Waterloo Region, they require it in order to get a permit, but in Cambridge they don’t. Having a consistent approach across the province where all businesses, regardless of size or revenue generation, are required to obtain a business licence and number, would put them on the radar, although many contractors get around that by asking homeowners to apply for the permits themselves. Not that the renovator’s information can always be trusted. “There are a couple of very depressed economic areas in our province where we actually charged and convicted a couple of registered builders for renting out their registration numbers,” says Tarion’s Waraich. Another recommendation was to address the resale market by requiring paperwork for any home alterations. “When you put your home on the resale market, your property disclosure includes questions like, ‘Have you done a renovation? Are the permits in place?’ Those could be important factors to consider,” says Vaccaro. As for her own suggestions, Albanese’s interim report noted the need for better collaboration within and across government channels. “Another constant theme that emerged from my discussions was how incentivizing homeowners and the public at large to use legitimate contractors could help contribute to tackling the underground economy,” she noted. While Albanese’s final report is likely still months away, her initial recommendations were reflected in the 2016 Ontario Budget, presented in February. Among the steps the Province is prepared to move forward with is an extension of its residential roofing pilot project for an additional two years, while examining opportunities to expand its scope to other areas of residential construction. Further, a public awareness campaign to highlight the risks and liabilities associated with participation in the underground economy will be developed, and specialized audit teams using advanced analytics and innovative enforcement tools will be launched. Additional penalties for those engaging in underground activities will also be proposed, as will partnering with natural gas utilities to help homeowners work with certified energy auditors and reputable contractors as part of the government’s investment in home energy audits and retrofits under the Green Investment Fund. Cohn, who has even had his CRA auditor request a cash deal, recognizes the need for change, even though there’s a silver lining to the current reality. “If it weren’t for the underground economy, I wouldn’t be nearly as busy,” he says. “I’d say 25% of my jobs are because of it. I had a client with a bathroom done four years ago, and we had to completely redo it. It probably cost them $10,000 to $15,000 for the original cash deal, then another $25,000 for us to come in, rip it out and do it properly.